Rabbit damage is enough to make you want to be an Elmer Fudd, rifle in hand. Here's how to minimize the damage in a more peaceable manner. 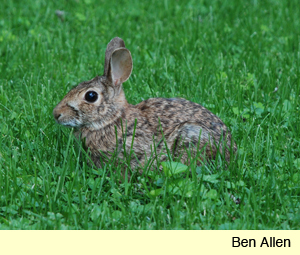 • Remember that rabbit problems vary from year to year. The population may be large (and therefore eat more of your garden) one year and do almost no damage the next. So if you're having a bad year with the bunnies, take heart. It may be better next year. • Most of the damage happens in the spring. Rabbits tend to nibble the plants we care about (tulips, newly planted pepper plants, etc.) in early to mid-spring when the plants are small, tender, and especially delicious to them. Also, later in the season, they have far more plants to choose from. 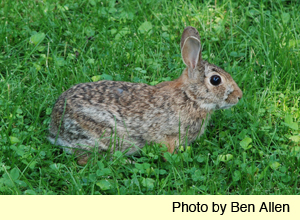 • There are a lot of home remedies for keeping rabbits away--human hair, blood meal, and more. But none of these have been proven effective. • Commercial sprays may work for a limited time and could be practical for small areas, but not entire yards. Also, read directions carefully to make sure the product is effective and safe. Some rabbit-repellent products could be harmful to pets and children. And some shouldn't be used on plants you're going to eat. • Removing cover where rabbits love to hang out is a help. Remove brush piles and weedy debris around the garden to discourage them from migrating over to your garden. • Trapping is a very effective way to reduce the damage rabbits can do. Of course, it takes equipment, time, diligence, and dealing with either dead or live rabbits. Click here for more rabbit-control information, including details on how to trap. The easiest and surest way to prevent rabbit damage, wildlife and horticulture specialists will tell you, is with fencing and wrapping. • Wrap vulnerable trees and shrubs with hardware cloth. One-quarter inch hardware cloth wrapped around the trunk of a tree 18-20 inches high and buried about inches in the soil will protect the tree from rabbits. Keep the hardware cloth an inch or more away from the trunk. 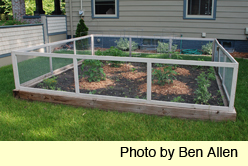 • Contain vegetable gardens and other larger areas with a low wire fence. All you need is a 2-foot chicken wire fence with the bottom edge buried a few inches into the ground. (Wire mesh that is one inch or smaller is best. )You can also place cylinders of .25-inch wire hardware cloth around young trees or shrubs. The cylinders should be taller than a rabbit’s reach while standing on snow and should be about 1 to 2 inches away from the tree trunk. 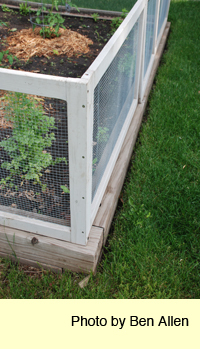 • For individual plants, like peppers, you can create mini-cages from hardware cloth—like a mini-tomato cage. Make them about 10-12 inches across and 18 inches high. (The top can be open.) Put them over the plant and then push or bury one end into the soil an inch or so down. In late June or July or so, when the plant is larger and not so tempting to rabbits, you can remove the cage. • For large plantings, like beans and lettuces, create mini cages by cutting and bending chicken or other mesh-like wire into a large, box-like shape--perhaps 1 foot deep, 1-2 feet wide and 6 or more feet long, depending on the size and shape of your planting. Invert this cage over new plantings to protect them for the first couple of months. Again, once the plantings get larger and less tender, in most cases, the rabbits will leave them alone. Below is a list from Cooperative Extension of the University of Arizona of plants that are both rabbit-resistant and deer-resistant. Those marked with an asterisk (*) are also slug-resistant.